Thousands of terrified Syrian civilians fled for their lives on Saturday, as they sought to escape two raging offensives in a rebel bastion outside Damascus and a northwestern Kurdish enclave. Syria's civil war this week entered its eighth year with world powers unable to stem a complex conflict that has killed more than 350,000 people and displaced at least half the country's population. Tens of thousands have taken to the roads with their belongings, as Russia-backed regime fighters push deeper into rebel Eastern Ghouta outside the capital and Turkey-led forces press an assault in the Kurdish enclave of Afrin. Civilians trudged out of Eastern Ghouta's Jisreen on Saturday after regime forces seized control of the town, many with small children walking by their sides. One man held up a Syrian flag as regime tanks rolled by. An AFP reporter in the nearby town of Arbin heard intense bombardment, as the month-long assault that has claimed over 1,400 civilian lives ground on. Air strikes killed 37 civilians across the shrinking rebel territory Saturday, the Britain-based Syrian Observatory for Human Rights monitor reported, most of them in the town of Zamalka as they prepared to flee. 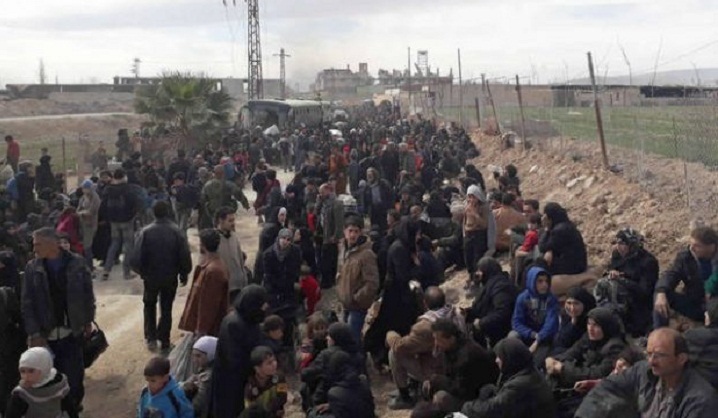 Throughout the day some 20,000 people did manage to stream out of the last rebel stronghold near Damascus, taking the total number to escape the carnage over the past three days to an estimated 50,000, the monitor said. Regime forces have retaken some 80 percent of Eastern Ghouta since launching a brutal air and ground offensive on February 18, carving it up into three ever-smaller pockets held by different rebel groups. Syrian state television showed dozens of civilians -- men, women, children and the elderly -- plodding along a road leading into regime-held territory. Several dragged suitcases while others carried children, kicking up dust from the road as they marched. Those fleeing clutched blankets or wore thick winter coats. Some civilians who have arrived in government-controlled territory have complained of having nowhere to sleep. "Women and children are on the floor," Abu Khaled, 35, who used to run a clothing shop in Ghouta told AFP. Since 2013, Eastern Ghouta's estimated 400,000 residents lived under government siege, facing severe food and medecine shortages in the enclave. Sixty patients were evacuated from the main town of Douma on Saturday, a medical source told AFP, on the fifth day straight of such evacuations. An AFP reporter there said shelling hit the town during the operation. On Saturday, rebel artillery fire killed one person in the capital, the Observatory said. In northwestern Syria meanwhile, more than 200,000 civilians have fled the Kurdish-majority city of Afrin in less than three days, according to the monitor. On Saturday, a Turkish air strike killed 11 civilians in the city as they tried to leave, it said. "There was fierce fighting throughout the night... as the Turkish forces and their Syrian allies tried to break into the city," the Observatory said. The monitor says more than 280 civilians have been killed since Turkey's Afrin campaign began, but Ankara has denied the reports and repeatedly said it takes the "utmost care" to avoid civilian casualties. In a regime-held area just outside Afrin, Syrians who had fled their homes were sleeping in mosques and schools -- some even in shops, a displaced person there said. "Some sleep in cars or on the roadside," said the person, asking not to be named, adding that rent prices in the area had soared. Late Friday, a Turkish bombing raid struck the city's main hospital, killing 16 civilians, the Observatory said. Hospital director Jiwan Mohammed told state news agency SANA the strikes had put the hospital -- until then, the city's only functioning medical facility -- out of service. Turkey says the YPG is a "terrorist" offshoot of the outlawed Kurdistan Workers' Party (PKK). But the Kurdish militia has also formed the backbone of a US-backed alliance that has successfully expelled the Islamic State jihadist group from large parts of Syria.